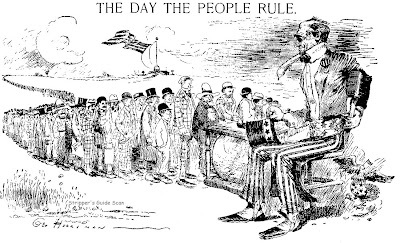 The first two cartoons were published on November 4 and 5, the last two on the 6th, election day. 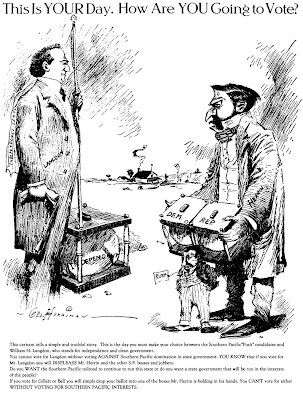 Herriman was clearly overworked on the 6th, both cartoons of that date being decidedly hasty, sloppy efforts. Next week be here when the election results come in. By the way, the text on the third cartoon is my retyping of the original which was a bit on the small side for legible reproduction at low screen resolution. Dear "stripper". First congratulate you. I follow your work for some time now, and I don't know where I would have so many delicious hours and comic's information without it! Secondly, I would like to ask your permission to use one of this images in my own blog. Of course I would mention clearly yours as the place where I stole it from! Thank you very much for sharing all this with the rest of us. You may use images from this site. I make no claim to copyright on them so I am using them as either public domain or as examples under fair use. On the other hand I put a great deal of work into scanning and cleaning up the images so a credit is appreciated. Latest of the "nasty brat" gag cartoons is a single-panel one-col­umn affair called "Dinah Mite" scheduled for first release Nov. 24. 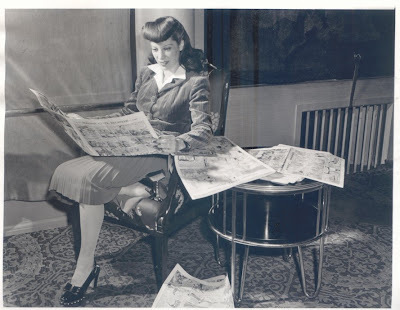 Editors Syndicate, New York, is handling distribution. Dinah, as you might guess, is a holy terror in small female form. 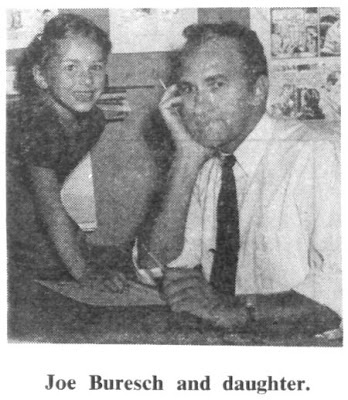 Creator of the new feature is Joe E. Buresch, and Dinah's pro­totype is his daughter, Linda Jean, not quite five and, he says, "the prettiest, nastiest, most lov­able gal this side of the Allegheny mountains." Mr. Buresch, 36, was born in Pittsburgh, Pa., and has been living within a dozen miles of his birthplace all his life. He reports he has been "making a fair living at cartoons since 1936." 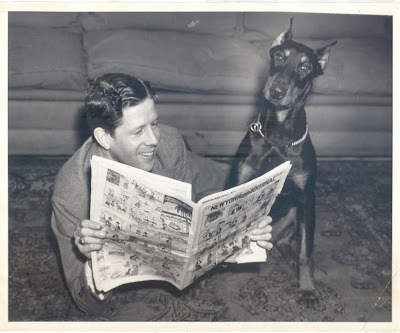 "I have no other work," he says, "and stick to the drawing board and typewriter morning and after­noon doing gags and cartoons for trade papers and general maga­zines. I started out with a small syndicate doing a detective strip which was translated into foreign languages, then worked for a group of comic book publishers and finally settled down to gag cartoons." His gag ideas have been used by top name cartoonists for sev­eral years now, and he regularly supplies ideas to two syndicated panels. Mr. Buresch's own car­toons have appeared in some 300 trade papers, as well as in slick magazines. What would we ever do without search engines? I've had this example of Wingtips, the only one I've ever found, sitting on my mystery pile for years -- the strip was never listed in E&P and I never found a run of the strip anywhere. But in a mere five minutes of Googling I succeeded in finding the creator, Mike Goodman. Turns out that Mike was a young lawyer with a yen to cartoon. He was able to get this strip starring a judge syndicated by Universal Press Syndicate starting August 17 1981. The strip didn't take off, though, and Mike says it was never in more than 38 papers. He moonlighted on the strip at night while keeping his day job as an attorney. Seeing that the strip wasn't taking off he and the syndicate decided to rest their case and the strip ended sometime in August or September of 1982. 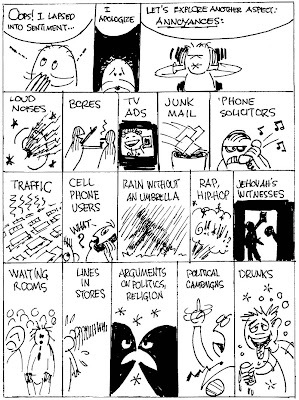 Mike these days is a successful lawyer in the firm of Goodman, Allen and Filetti PLLC and still does some cartooning. These days his work appears regularly in the Sunday Business section of the Richmond Times-Dispatch. Have you ever read a webtoon by an artist named John Klostner (I think) who did Mason Darrow? It's also about a lawyer. I think he finally gave up on it, haven't seen it in quite awhile and can't find it on a search. I have a John Klossner doing a strip called "On The Rocks" in 1990, but that's as close as I can come. Anyone? Wingtips was in the Cincinnati Post from 1981 to March 27, 1982. Coincidentally, that was the weekend the E----r got rid of another comic with a judge's name in the title - Judge Parker. 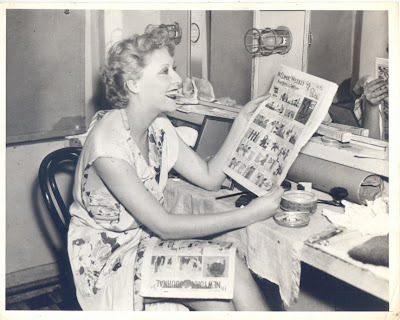 It's always fun to see old photos of people reading newspaper comics. Here's a neat batch of photos, all courtesy of Cole Johnson, that depict various Hollywood types caught in the act of enjoying the funnies. Commentaries below each photo by Cole Johnson. I've thrown in my two cents in [square brackets] telling you stuff you probably already knew. 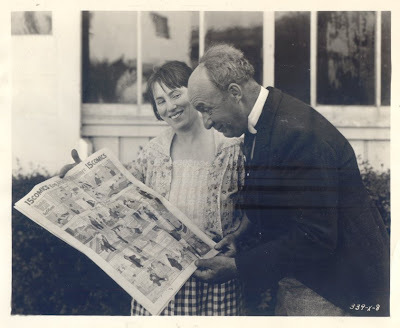 Polly Moran and J.Farrell Macdonald, stars of BRINGING UP FATHER (MGM 28), look over the August 1, 1927 LOS ANGELES EXAMINER comic section. The careless casting ("Jiggs" is taller than "Maggie") tells a lot about the production. Like so many films based on comic strips, the first thing they do is tamper with it's conventions, and produce something nothing like the actual strip. In this case, the film is centered on Jiggs' usually boring background character daughter, Nora, and her attempts to restore the family fortune. 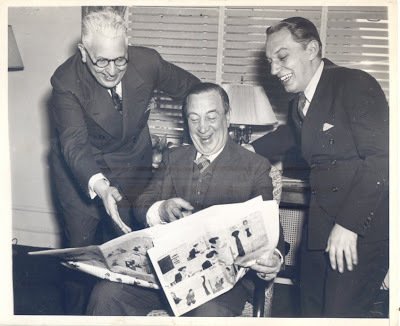 Russ Westover, comic actor Hugh Herbert, and Otto Soglow pretend to have a belly laugh with the April 10, 1938 LOS ANGELES EXAMINER section. 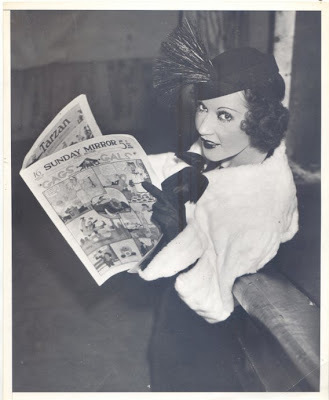 An odd bit of publicity for THE GOLD DIGGERS GO TO PARIS (WB 39), in which Herbert appeared. 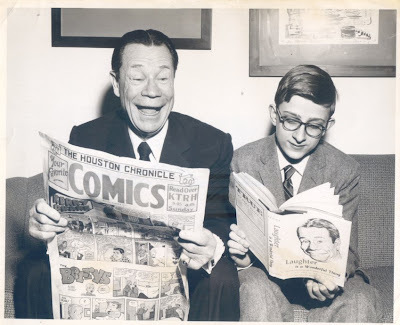 Comedian Joe E. Brown with 15-year-old John Trever, Jr., of Charleston, W.V., who won first prize in the Newspaper Comics Council's contest, "What newspaper comics mean to me." Both are seen in New York, even though for some reason Joe has the HOUSTON CHRONICLE comics (for March 3, 1957). Joe is promoting his book, "LAUGHTER IS A WONDERFUL THING". I'd like to see what the kid wrote to win the prize. Many thanks to Cole Johnson for sharing these delightful photos! The contest was to draw a cartoon picture and write the essay in 100 words or less. "Newspaper comics are a strong influence on American children and a long-standing American tradition. Many of us wish we could do the things the characters do and be in their places. I get numerous laughs from the silly antics of some characters, and the continuing adventure comics stimulate thought and excitement." As reported in The Delta Democrat-Times of Greenville, Mississippi on March 7, 1957. Quite the silver-tongued devil Trever was. Thanks for rooting that out DD. My guess is that several different photos were taken, each one showing Brown holding up the comics section of a different member of the Newspaper Comics Council. 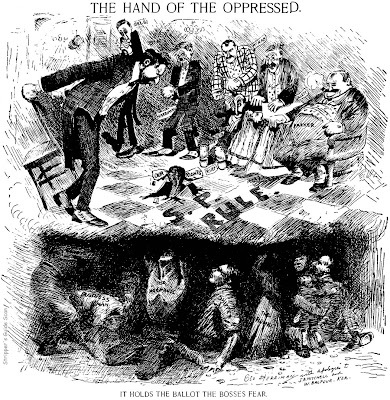 John Trever, Jr. is today the political cartoonist at the Albuquerque Journal.-----Cole Johnson. 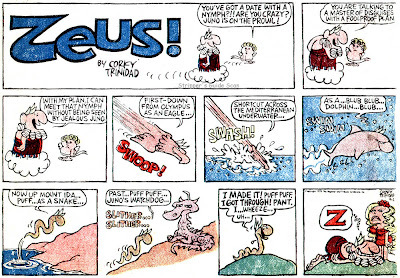 Obscurity of the Day: Zeus! as this is definitely not on the average school curriculum hereabouts. Zeus! ran from April 1 to December 8 1979 as a Sunday and daily strip. In a syndication oddity that I don't understand, the Sunday was copyrighted to Murdoch News Features while the daily was from the aforementioned Register & Tribune. 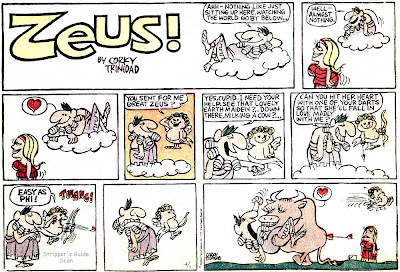 Corky Trinidad is still active in editorial cartooning, and offers reprint books of Zeus! and an excellent strip he did for Stars & Stripes, Nguyen Charlie. Go check out his website. Since you mentioned local strips few weeks ago and since you brought up Stars and Stripes. I actually have the first strips for the above, so I know the dates. They also run a strip called "Downrange" by Jeffrey Hall. That began sometime around 2005 and if you search for that strip, yes, it's actually a stick-figure comic. Thanks very much for the info on new S&S strips. That brings up an important question for the Stripper's Guide index. Since SG only lists strips that ran in the U.S., does S&S have a domestic edition? If not then I really shouldn't list any of their features. No idea, although the headquarter is in Virginia, near Washington D.C. You could probably pick up copies if you live there. I went to the S&S website and they only seemed to be offering subscriptions of two editions - European and Pacific. Sorta seems like there is no domestic distribution. Which is kinda weird since the strip "Jenny" seems to be intended for military wives who presumably are mostly back in the states. Hi, Allan. You're right about the "Jenny" audience being mostly stateside. I, however, live in Okinawa. I thought it'd be best to test the waters with a generic base in Florida before sending anyone to an overseas assignment. The characters discuss their previous PCSes to/from Germany and we now have a character packing up for a PCS to Japan. Even though the S&S doesn't publish stateside, the audience shares/reads online. I'm trying to keep the topics of the episodes generic enough that any spouse can relate. My e-mail seems to bear that out so far but I had to get somebody over here to experience what I've dealt with over the past couple of years...therefore, Cassie will take the plunge and be the token fish-out-of-water spouse (as soon as she figures out how to PCS, that is!). Thanks for the mention in your blog. I'll definitely keep reading. Thanks for the info and best of luck with your comic strip. Do let us know if you ever publish a reprint book -- seems like interesting reading, even (or perhaps especially) for those not in the same situation. I for one enjoy strips that give me a peek into different lifestyles and livelihoods. Thank you for mentioning me in your blog, i hope you enjoy reading the strip. I do regret that the Stars and Stripes do not print our strips in color, it definetely takes away from the intended full effect, the colored strips can be seen on my site. PS: Do you have any early work prior to EC Comics from Harvey Kurtzman? You'll find a great early Kurtzman obscurity on the blog. Just search the blog on keyword Kurtzman. Corky just died today. Probably a good time to revisit this strip. As cartoonist biographies go I daresay that there has never been, and will likely never be, another of the length and depth of R.C. Harvey's Meanwhile. Coming in just shy of a four digit page count it could scarcely be otherwise. Even more so when you consider that the impressive heft of the tome is not substantially padded with photos and art. To be sure the book is indeed well illustrated, but only with visual aids directly related to the narrative -- there are no long reprints of Caniff's strips here or lengthy portfolios of miscellaneous art. It is the nature of any successful cartoonist that they spend the bulk of their life hunched over a drawing board, endlessly skrith-skratching away. This is not the sort of lifestyle that would seem to lend itself to a lengthy biography. When we consider that there are plenty of well-rounded biographies of political figures, film stars, activists, people whose lives are filled day by day with the fodder of the biographer, that manage to tell their stories in a shorter page count, we have to wonder just what in the world Harvey is on about in a page count that rivals the King James Bible. I for one certainly approached the book with trepidation. I've been a fan of Harvey's work for years, but my enjoyment of his work is tempered with the caveat that he is on occasion guilty of going over the top. When he goes into critical analysis mode he is always perceptive and thoughtful, but he can also beat a horse within an inch of its life. I was concerned that here Harvey would be shooting the works, analyzing Terry, Steve and their creator ad nauseam. That fear, I'm happy to say, was completely groundless. Despite the enormous page count this book is, wonder of wonders, a tightly written narrative. 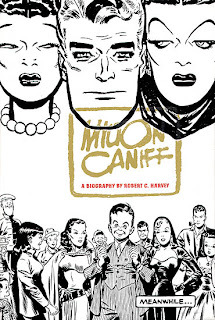 In the tradition of classic biography, what critical analysis there is is grounded in the opinions that Caniff himself discussed with Harvey and others in interviews. Given that Harvey says the book in its original form was some 700 pages longer (!) than the final revision, I'm guessing that any extended author's analysis fell victim to the editor's red pen. If so, the book is better for it. So what exactly does lurk between the distantly separated covers of this volume? Well, Harvey was lucky enough to be tapped by Caniff himself as his offical biographer in the early 80s. This afforded the author with ample opportunity to question his subject at great length. While Caniff was, as Harvey relates, not a particularly forthcoming interview subject, by dint of persistence the author eventually ended up with a treasure trove of Caniffiana. The book is, as we might expect given the size, an impressively complete chronicle of Caniff's life and the times in which he lived. However, completeness doesn't necessarilty translate to interest-sustaining or entertaining, and that's where Harvey's book truly amazes. I've read plenty of long form biographies where it got to the point that I was rooting for the subject to kick the bucket to cut the narrative short. That's not the case here. While I couldn't say that every single page is riveting, edge-of-the-seat reading, Harvey does an expert job of keeping the reader involved and interested all the way through. Any reader who is at least moderately interested in comic strips, even those not particularly fans of Caniff, will undoubtedly find the book fascinating. Speaking of being a fan of Caniff, I should admit that I am not numbered in that legion. Of course I recognize Caniff's importance in the history of comic strips and the artistry of the two strips for which he is most famous. However, I think Caniff's writing is far too precious, heavily laden with hokey slang and tortured vernacular that I find grating and distracting. His subject matter, primarily military adventure, is just not my cup of tea. His cartooning, after a relatively short but glorious period in the early 40s when he was first influenced by Sickles' innovation of chiaroscuro comic strip illustration, later takes things too far for my taste, turning the strip into a series of ink-blots (not entirely Caniff's fault, of course - the comic strip was shrinking more rapidly than he could adjust his art style to suit, finally ending up so small that no one, not even Caniff, could possibly do a realistically rendered adventure strip). The point is that you don't need to be a Caniff fanatic to thoroughly enjoy the book. I recommend it not only to the ardent Terry or Canyon fan, but anyone with more than a passing interest in the art and business of the comic strip in America. Caniff's story is, after all, the history of the adventure comic strip in particular, and the newspaper comic strip in general. Harvey does a superb job of weaving all the various aspects of the story of American comic strips into the narrative. We see Caniff marketing his comic strips (and find out just how tireless a promoter he was), we see him coping with the miniaturization of his daily and Sunday spaces, we gain a deep understanding of the relationship between the creator and syndicate. We learn one cartoonist's reaction to the unforgiving daily deadline pressure, and how assistants and ghosts can become indispensible in the process of producing a strip that doesn't have the luxury of relying on simplistic art and daily gags. We learn the intricacies of producing an integrated daily and Sunday storyline, a balancing act that is one of greatest tests of skill that any writer could ever face. 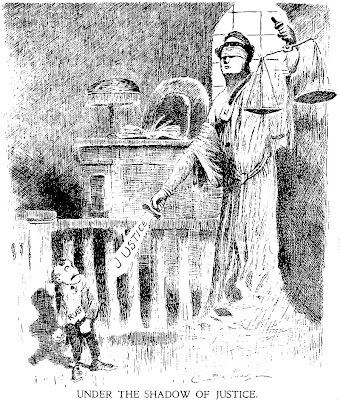 We see one cartoonist's bold reaction to the demonization of his art form when accused of being, bizarrely, a cause of juvenile delinquency. We see how a cartoonist deals with the use, and misuse, of his creations in other media like movies and television. I have only a few minor criticisms of the book, most worth mentioning if only so that this review doesn't seem utterly slavish in its support. First, the book is divided into just nine epic length chapters. It would have been more reader-friendly had it been broken up into more manageable chunks that could be read at one sitting. And although there are illustrations throughout the book, usually well-placed to coincide with the related narrative, each chapter ends with a gallery of additional illustrations. These sections would have been better broken up and dispersed throughout the text, if only to relieve the long stretches of type-dense pages. The narrative flow drags a bit for a hundred pages or so near the end of the book. By this time Caniff was constantly being lured away from his drawing board by an endless procession of accolades and honors from every organization under the sun. Harvey unwisely devotes a considerable amount of space to the details. This section, while it does have occasional interesting points, could have been shortened. If the purpose was to show that Caniff was revered by his peers and his fans, well, that wasn't much of a secret anyway. Finally I have to question Harvey's use of invented conversations. In the first half of the book the author occasionally uses a device where he stages a conversation, usually set in Caniff's favorite watering-hole, in which we eavesdrop on a group of cartoonists shooting the bull. Harvey uses the device to impart some information in a presumably more entertaining method than dry prose. The device falls flat, though, because the conversations are stilted and too obviously staged for our benefit. And although Harvey makes no secret that the conversations are his own inventions, in a scrupulously researched work otherwise factual throughout I found these passages somehow discomforting from the standpoint of journalistic ethics. Call me a stick in the mud. These are all picayune little quibbles, though. Harvey's work is, quite simply, a masterpiece of biography. He has set the platinum standard by which all future cartoonist biographies will be judged. Most, likely all, will be found wanting in comparison. It is one thing to produce a thick book, and not necessarily a good thing at that. It is an entirely different thing that Harvey has achieved here. He has produced a work of lasting merit, eminently readable, brimming with meticulous research, a work that must be atop the required reading list of every cartooning fan and cartoonist. Thanks for the review. I couldn't get through the early years myself, but maybe I'll pick it up later. 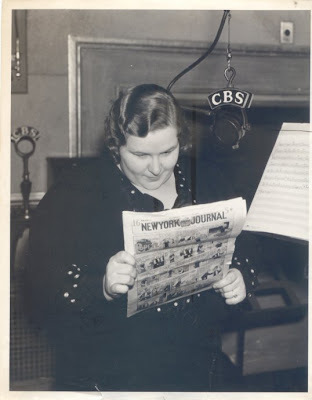 On a different note - I see in Hogan's Alley that an article is announced on Lee and deCarlo's My Friend Irma. Can you tell me who is writing that? "As cartoonist biographies go I daresay that there has never been, and will likely never be, another of the length and depth of R.C. Harvey's Meanwhile." I can think of one exception: Harrison Kinney's 1200-page biography of James Thurber. I was glad to read in your post that the book is tightly written; like you, I also am at times critical of Harvey's occasional tendency to overexplain a given idea. Even though the invented conversations you mention don't sound very appealing, I look forward to reading this book soon. Is it fair to call a bio of Thurber a cartoonist biography, though? That was a very minor part of what the man was famous for, sort of like saying the same for, say, a bio of Enrico Caruso. And don't sweat those invented conversations, they take up maybe four or five pages in the whole book. There's also a 1006 page biography of Hergé ("Lignes de vie" by Philippe Goddin, published in 2007). Jim was never one to tolerate fools gladly... except for Beatty and I.